Jumpshare is a service I just learned about that lets you easily share and view files online, for free. 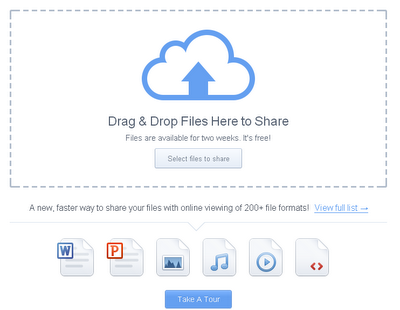 Simply drag and drop your files to the site and then you can share them. Other sites let you do this, but Jumpshare has a very cool feature of it's own - people can view these files online without downloading them. This is a great feature, especially when many shared files are just so someone can view it. The files are available for two weeks and it's completely free. The site supports over 200 different file types (read the whole list here) including graphics files, Office files, e-books, audio and video files, and even code files. A great new way to share files. For free.